Robert McGladdery was a 25-year-old unemployed labourer who lived with his mother in Damolly. His mother described him as violently self-abusive and paranoid. “He was prone to nightmares and was paranoid about the police following him at night,” Agnes McGladdery said. McGladdery had spent a couple of periods in borstal training and had a record of sexual and physical abuse of young women; he also had a conviction for stabbing a man in Newry. Pearl Gamble was a pretty young shop girl. She lived at home in Upper Damolly with her parents and three sisters and would often go to dances with her friends. And it was at a dance on 27th January 1961 in an Orange Hall in Newry where she would spend the last few hours of her life. Pearl went to the dance with a few friends. McGladdery went to the dance with his friend Will Copeland after a long drinking session. Witnesses said that Pearl danced with McGladdery twice that night. Aware that Pearl would get a lift home from the dance and would be dropped at the Upper Damolly crossroads, McGladdery stole a bicycle and cycled to the crossroads where he waited for her. Moments after she got out of the car McGladdery attacked her. He struck her across the face breaking her nose and then dragged her into a field. He then punctured her heart with a workman’s file before strangling her with a scarf. McGladdery dragged her lifeless body across three fields, where he left her lying face down in a clump of bushes. A search party was organised after a man out walking discovered some of Pearl’s ripped clothes scattered around a field. “I wish I could get my hands on the boy that done this, you wouldn’t have to deal with him,” McGladdery told the police. McGladdery’s description of what he was wearing that night and what time he left the dance didn’t match with other witness accounts. McGladdery insisted that he was wearing a dark blue suit and left the dance at 1.50am. But witnesses said he left the dance around 1.30am wearing a light coloured suit. After a long search the police found the light-coloured waistcoat and overcoat inside a pillowcase hidden in a septic tank not far from the murder scene. The trial was held in Downpatrick. 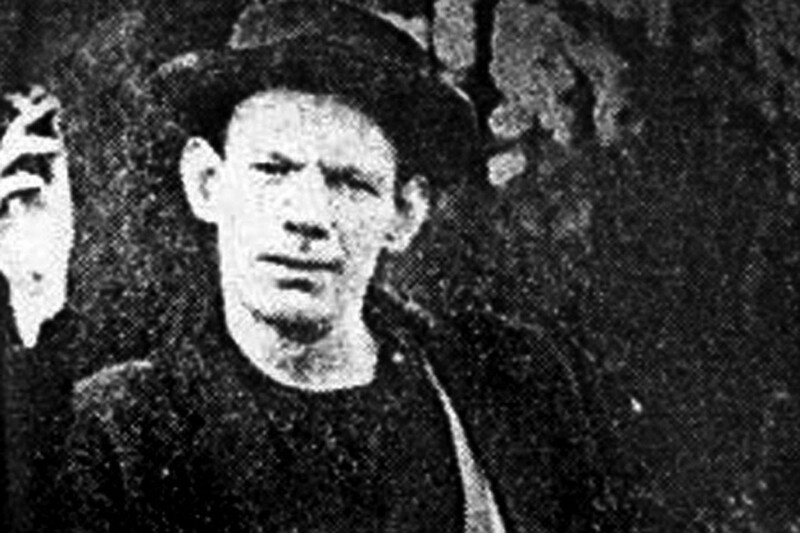 Throughout the trial McGladdery protested his innocence and even tried to implicate his friend Will Copeland by saying he had loaned Copeland clothes similar to those found in the septic tank. McGladdery showed no emotion as Lord Justice Curran donned the black cap and pronounced the words of the death sentence. After a failed appeal, the date of execution was fixed for December 20th. More than 150 petitions were sent to the cabinet offices at Stormont for the reprieve of Robert McGladdery. On the morning of December 20th 1961 McGladdery awoke early after a quiet night in the death cell; his mother had visited the night before. Prior to facing the hangman, McGladdery finally confessed to Presbyterian chaplain Rev. J. Vance that he had murdered Pearl Gamble. About 30 people gathered outside Crumlin Road jail, they waited in silence until warders from the jail posted the notice announcing that the death sentence had been carried out. Robert McGladdery was the fourth man to be sentenced to death in the north in 1961; two men George Bratty and Patrick Gallagher were reprieved. The other man was Samuel McLaughlin who was hanged on July 25th 1961. There were a total of sixteen executions in the north of Ireland during the 20th Century, all of these were for murder. Twelve executions took place at Crumlin Road Jail, three at Derry and one at Armagh. Seventeen men in total were hanged at Crumlin Road prison between 1854 and 1961. Albert Browne, a member of the UDA, was found guilty of killing a member of the RUC in October 1972 for which he was sentenced to death but this was later commuted to life imprisonment. William Holden, who had killed a soldier, was the last person to receive the death sentence in Northern Ireland and his was also commuted. The death penalty was later abolished as part of the Emergency Provisions Act.